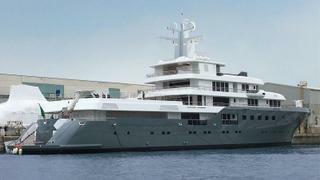 The recently-launched 73.2 metre motor yacht Planet Nine is listed for sale by Stuart Larsen at Fraser. Launched last week at Italian yard Italian Sea Group and due for delivery in March 2018, this 2,100GT motor yacht boasts an ice-classed steel hull and an aluminium superstructure. British designer Tim Heywood created her exterior styling, while the light, airy and modern interior design is courtesy of Mlinaric, Henry and Zervudachi. Accommodation is for up to 16 guests split across eight elegant staterooms, including a separate owner’s deck, a main-deck VIP suite, and six further double cabins with king sixed beds. Meanwhile, the crew quarters on this yacht for sale allows for a total staff of 26 people in 13 cabins. Key features include a commercial-standard helipad on the aft deck, with a hangar beneath. The side-loading garage provides storage space for three Rupert tenders measuring from 6 to 9.72 metres, while the guest elevator provides easy access to all four decks. Exterior relaxation options are plentiful, with a large beach club in the transom and a sundeck spa pool offering spectacular views out to sea. Power comes from a pair of 2,575hp Caterpillar 3516 engines for a top speed in excess of 16 knots. When trimmed back to 14 knots, she can cruise for 6,000 nautical miles without needing to refuel her 245,500 litre tanks. Quantum zero speed stabilisers ensure a smooth cruising experience, while the dynamic positioning system makes it easier to visit remote and environmentally sensitive areas. MCA and LY2 compliant, Planet Nine is asking €85,000,000.